I was as good as gold. I did everything the adults told me to do, particularly if the directive came from Aunt Bett. Somehow that little woman put the fear right into my soul. However, there was one day when I broke a rule, faced the wrath of Aunt Bett, and learned how to whistle all at the same time. We really did not have to climb very far to find comfrey in the mountains of southeasten Kentucky. It was a tall plant and could be seen towering over other plants that grew in the same sunny spot. 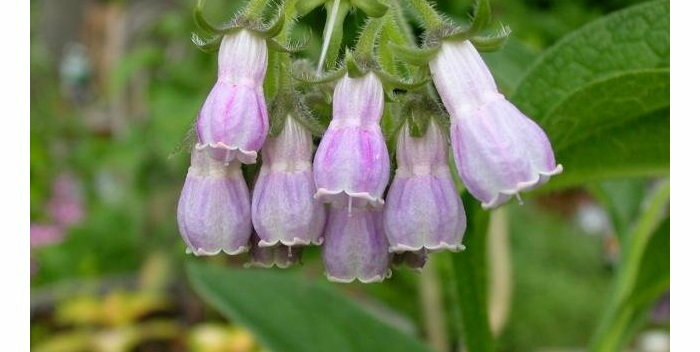 Comfrey (Symphytum) was an herb that seemed to make Aunt Bett uncomfortable. Normally I thought she always showed the most self confidence when talking about her herbal remedies, but with comfrey, she was a little hesitant. Keep that in mind as I take you on another journey with Aunt Bett and me, because I think she was wise beyond her years. When I mention to you that Aunt Bett scared me, you need to know that it was not the kind of fear that sent me running in tears to hide behind the dark wine horsehair sofa. It was more of a very respectful feeling. I knew she was there to teach me, and though I didn't always agree with what she wanted me to learn, I did it out of respect. It is important that you know the difference, I think, because even though I dreaded the early morning treks up the dew covered mountainside, I remember that my heart always fluttered when I heard her come for a visit. It seemed as if magic lights swirled around her, even when she lowered that asphidity bag around my neck. Looking back now, it was awe, not fear, that bound me to Aunt Bett. Comfrey was another story. In the mountains sometimes there would be a bit of level ground high up on a mountainside, and it was not unusual to clear that bit of level ground and plant something on it. My great uncle owned the land across the road (and creek) that ran in front of my Granny Ninna's house where we lived. From my upstairs bedroom window I could look across the road and above their house and see at least two levels of cornfields high on the mountain. They often rotated the crops, so it wasn't unusual to see tomatoes one year, beans another, but almost always there was corn on one or both of those levels. When one field was left untended for one reason or another, comfrey would often grow there. One morning Aunt Bett appeared on the back porch, family always came to the back porch, only company came to the front, so here was Aunt Bett carrying a bucket of freshly picked green peas. I loved peas and was happy to help her and mom string them and break them into bitesized pieces. I always helped string peas and then beans because that meant I could sit around and listen to Aunt Bett stories. But on this morning in particular, Aunt Bett came to ask Mom's permission for me to go with her to the upper field above her house to pick comfrey. She always asked Mom's permission before our little ventures, and my mother always said I could go, but this would be my first time to gather comfrey. I continued to string the peas, listening to the drone of their voices, when I heard Aunt Bett say: "Young lady, you be ready to leave at 4 sharp." Huh?? Four what? Morning or evening? She went on to tell me that the leaves of comfrey needed to be picked between 5 and 6 p.m. and we had to pick them before the comfrey flowered. I never knew why it had to be picked at that particular time, or why the leaves needed to be picked before the plant bloomed, but I suspect it had to do with nutrients in the leaves after they had been in the sun all day, and before those nutrients were weakened by their distribution into the blooms. Well, I knew what comfrey looked like when it bloomed, but how was I supposed to find it without its flowers? Most of the time the flowers were the only way I could recognize a plant. "Yes, mam," I said and thought that was it for the conversation. But Aunt Bett had more to tell me: "Comfrey ain't no easy plant to pick," she said. "You don't want the leaves to stick to you in places where it ort (ought) not be". Huh?? But she didn't explain any more, just asked my mother if I had any deep cuts on my body anywhere. Me with deep cuts? Absolutely not. I could climb any tree and hang upside down for 30 minutes without getting a scratch or breaking a sweat. I couldn't run worth a hoot, but I sure could climb, and I could swing like a monkey from one branch to another without ever falling, so rarely did I ever have a deep cut. I wondered why she asked that. She didn't tell me the answer at that time, but when 4 p.m. arrived, I walked down the narrow road to meet Aunt Bett. I was probably going on 10 that year, so I was feeling pretty independent and had on my old jeans rolled up, my socks rolled down and a bandana tied around my neck. That lasted a good 3 seconds because the first thing Aunt Bett did was to point to my socks and then to my jeans and told me to roll them up and roll them down! And that was that for the 10 year old fashion plate. The bandana got to stay though, because it was used to wipe the sweat that would surely roll down my face. And yes, the asphidity bag was well in place. We got to the cleared spot about half way up the mountain, from there I could turn around and see all the beauty that surrounded me. I could see the pattern of the creek as it ran down the mountainside very close to my Granny Ninna's house where I lived. I could see the rock cliff overhang where I often stopped and had my little peanut butter sandwich when I was traipsing around in the mountain behind my house. It was also where I carved my name in a little maple sapling when I was seven and wasn't supposed to be near a knife. It wasn't discovered till years later, so I didn't get the punishment I feared. "Comfrey," she said, "grew in the Garden of Eden. It is that old. It was used to treat the wounds of the armies of Alexander the Great, and through the years it has been used as nature's bandage. It is a knitter of wounds," she said, "but you have to be careful to pack it into the wound, so the wound can heal from the inside out." She went on to say: "If you make an infusion of comfrey, it is thought to be good for asthma, lung ailments, sore throats and pneumonia, but I don't use it for that purpose. I don't think it is good to put into your body. 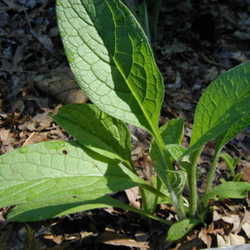 There are other things to use for inside your body, comfrey should only be used on the outside." I am not sure how Aunt Bett knew that at the time, because that was during the fifties, and it has only recently been established that it is definitely not good for the liver. As I always said, Aunt Bett was magical. We pulled out our paper sacks, always stored smallest into largest, our little bag of clothes pins, and Aunt Bett's burlap sack out of her skirt pocket and started picking comfrey leaves. Aunt Bett said little until I asked her about the tiny hairs all over the leaves of the comfrey plant. They felt funny to my fingers, much like velcro feels now. I noticed as I rolled a leaf in my hand it would stay rolled. I thought that was pretty funny and put it in my mouth like a whistle and started blowing through it. When Aunt Bett realized what I was doing, she grabbed that leaf from my mouth and threw it on the ground, smashing it with her foot. "Let me see you move your lips," she said. My lips? Oh dear, my lips were still puckered just as they had been around the leaf. "Now that's what happens when you put a leaf of comfrey over a wound," she said, "and if you are not careful you will find yourself with a permanent pucker. Don't ever put a piece of comfrey in your mouth or up your nose, 'cause it will bind your flesh together and you won't be able to eat or to breathe." I was too scared to speak, and wasn't sure I could utter a word. My mouth did feel strange, and was still set in a sort of open pucker, and I could feel the weird fuzziness the comfrey leaf had left on it. I started blowing through the hole between my lips. Nothing happened, I put my tongue against the hole and blew....of course all this time I had my back to Aunt Bett because I didn't want her to know my mouth was permanently glued together because I had disobeyed her. Tongue against lips, blow, blow, blow. Tongue against lower teeth, blow, blow, WHISTLE!!!! I could whistle. The noise on that quiet mountain scared Aunt Bett and me to death! But my mouth blew open and I was no longer in a permanent pucker, plus I had learned how to whistle. Aunt Bett said not a word, but I could see her when she thought I wasn't looking.....her shoulders were shaking so hard I knew she was laughing. Whew, I once again had survived the wrath of Aunt Bett! Once we got back to Aunt Bett's house the leaves were washed and strung on a long string of twine and left to dry hanging on the rafters of the back porch. I went home and immediately checked the mirror to make sure I was not in a pucker. Then I practiced whistling. Aunt Bett made an infusion of the comfrey leaves, but true to her word, she did not let anyone ingest it. She used it as a thin liquid to cure diaper rash, arthritis, and as a hair rinse. She also used it when making soap, but I was not lucky enough to keep her soap recipe. If a cut was not very deep, she would place fresh whole leaves over the cut, bind it, and in a short time the cut was healed, but then she also used other herbs for healing cuts as well. 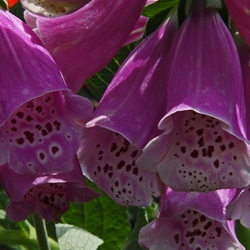 Even today, studies have shown that comfrey makes the cells grow faster, thus quicker healing. Warm oil and comfrey in top of double boiler for 30 minutes to an hour, depending on the heat of the stove, stir, but don't boil. Pour through a strainer, throw away herbs and roots, save every drop of oil. Melt beeswax on top of double boiler, add oil and stir till it is all blended together. Pour into salve tins that won't leak. 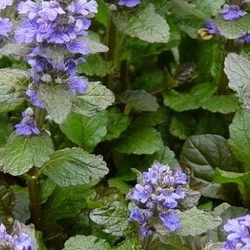 In Aunt Bett's opinion, the salve was used for many things: all skin irritations, bug bites, poison ivy, diaper rash again, psoriasis, and eczema. She gave the salve as gifts throughout the year, and I was always happy to get one of her tins of comfrey salve. Today I often look for confrey salve in natural food stores. One of the neatest things about comfrey in my opinion was that it made a golden yellow dye. All I had to do was boil the leaves for several hours, strain the leaves out, and then place my white fabric in the liquid and let it set overnight. Beautiful golden yellow! Most of the time I was given muslin feed sacks to use for dying, but sometimes Mom might give me a scrap piece of cotton fabric that was much nicer than muslin. I learned to piece quilts from her scraps and from those that I dyed. By the time the sixties and seventies came along, I could tie dye with the best of them, thanks to my Aunt Bett and days spent at her knees learning everything she could teach me. I am a retired high school art and humanities teacher. I grew up in the Appalachian mountains of southeast KY and now I live with my two rescued cats, Jazz and Daisy, in far western KY. I am an artist often doing commissioned work, and in addition to writing articles for Dave's Garden, I also write boating stories for a nautical magazine as well as other venues. My greatest loves are writing, painting, my 5 year old grandson, then learning the history of our numerous wildflowers in Kentucky. And, of course, there's gardening.